I took one look at this skirt when I finished it and said, "This needs suspenders." I actually finished it before Skirt 2 but it took me for.ev.er to find the stupid suspenders. And the longer I looked the more stuck I got on the idea and refused to photograph it without them. What I want to know is: who are all these stingy old men who are refusing to donate their suspenders to Goodwill?? I finally found some at Wal Mart yesterday for $6.50. And I'm afraid you're going to be seeing a lot of these around here because, as it turns out, I love suspenders. I used this tutorial from Adventures in Dressmaking and I'm really pleased with the results. I used one of Aaron's old shirts and a button from my stash (came as an extra with a peacoat I bought 2 years ago) so I didn't have to buy anything. Plus, this skirt marks my first waistband* and my very first buttonhole. Exciting times, my friends. Exciting times. 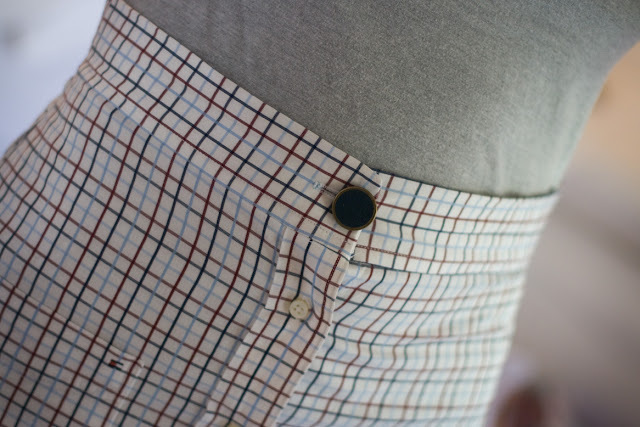 *This website had the best step by step waistband tutorial ever. She mentions it in the original tutorial I linked to above but go to "Sewing Techniques", then click "waistlines" then "straight waistband" and prepare to make a perfect waistband on the very first try. Adorable! You pull of the suspenders very well! I love the suspenders! They make the outfit. You seriously are amazing! The suspenders just make the outfit. Did I ever tell you I love your hair? Cuz I do. I've always wanted that color hair. You rock it. Your hair and makeup look really good today. I'm jealous as I sit here in my glasses and pajamas. Actually, 3rd set of pajamas today after getting puked on a bunch of times. I look glamorous. And a perfect waistband on the first try? Impossible. So cute! I love that you used one of Aarons shirts to make it. It turned out so great! OMGoodness...I love the suspenders so much!! What does photographer think about the suspenders? Haha, i like them! Great job! I'd love for you to link up at Inspire Me Mondays! Really cute! I don't think I could pull off this looks (short-waisted) but it's awesome on you! The skirt is great! I hope you'll link up to Make It Wear It @ TheTrainToCrazy.com! Creativity is Lacking. Insert Title Here.